Imagine strolling out to this garden in spring with the warm sun on your shoulders and tons of color at either side. What makes this pathway planting such a pleasing retreat? Most of these plants are low-growing, shorter than waist height, so you can see the entire planting easily. The hedge in the back of the garden divides a large space into smaller, more intimate garden rooms, while protecting plants from wind and cold. If you’re looking to brighten up your spring space, click ahead to find out what else makes this spring pathway planting so welcoming. A short stretch of the pathside planting has lower-growing plants, creating a “window” to view the bench and a bit of emerald-green lawn. 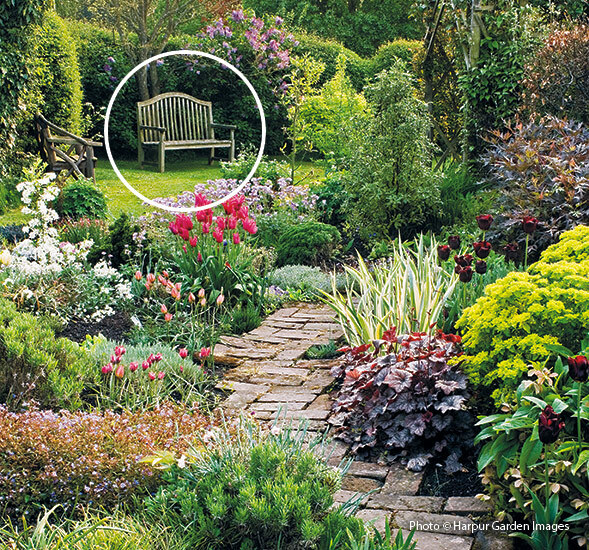 Taller plants on either side of the “window” also help to frame the view, directing your eye to the bench. The simple bench, backed up against the green sweep of a hedge, is both a focal point and a place to relax. Late tulips serve as colorful punctuation along this pretty pathway. Not only that, they’re happy here, surrounded by perennials that don’t need much extra summer water. But bulbs aren’t the only way to add color! 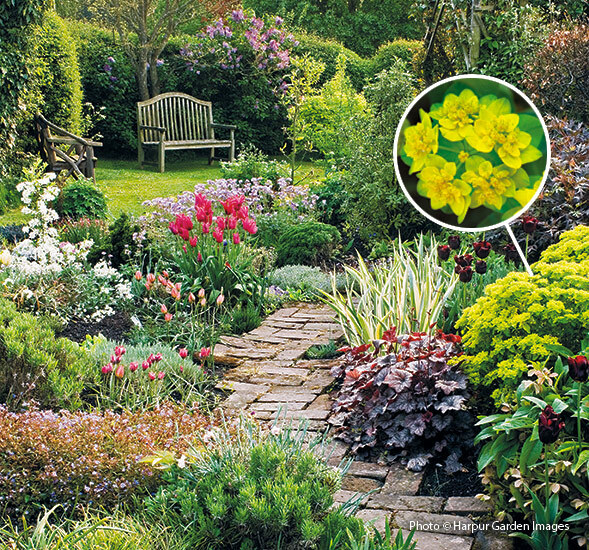 Some spring perennials’ flowers are more dainty than showy, but not cushion spurge (Euphorbia polychroma). The blazing yellow-green bracts of this perennial last for weeks and can really electrify a garden. Plus it looks good with almost any color you can pair it with. 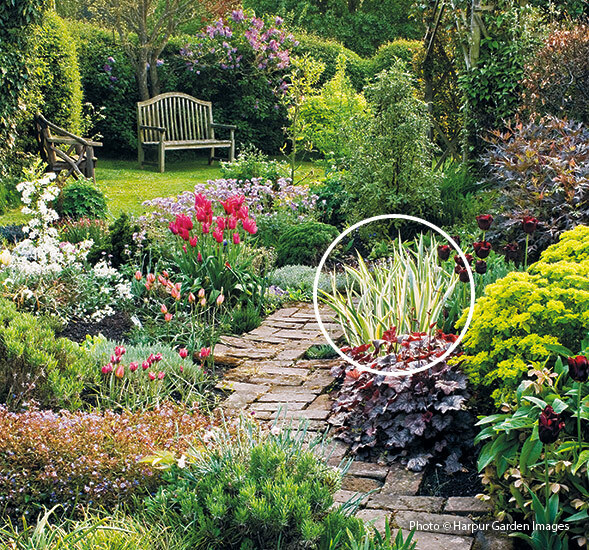 Most great plantings keep your interest because they offer up lots of contrast. This one has many shapes and textures that encourage you to look around and admire the tapestry of plants. The spiky variegation of this sweet iris foliage (Iris pallida ‘Variegata’) and striking shapes of the tulip (Tulipa hybrids) blooms poking above the other plants add energy to the rest of the garden, made of mostly mounding shapes.